Lockheed Martin says that they have developed a new energy-efficient graphene-based water desalination technology. Lockheed developed new graphene filters that has nanometer-sized holes in them that allow water to pass through - but not salt molecules. The energy required to "push" seawater through these filters is very low because graphene is so thin. In fact graphene is 500 times thinner than the filter available today, and this filter will require about 100 times less energy. Lockheed patented the new filtration system, and calls the new material Perforene. Lockheed is not ready to commercialize this technology yet. They are still refining the process for making the holes in graphene, and also the production process of the graphene itself. They expect to have a prototype filter by the end of 2013. This prototype will be a drop-in replacement for current filters used in reverse osmosis (RO) plants. They hope to commercialize this technology by 2014-2015 and are looking for partners in the filter manufacturing arena. This is not the first time we hear of water desalination using graphene membranes. 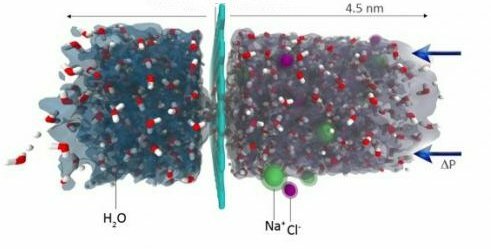 In June 2012 MIT scientists have shown (in simulations) that nanoporous graphene can filter salt from water at a rate that is 2-3 orders of magnitude faster than today’s best commercial RO desalination technology. Back in October 2010 researchers from Australia and Shanghai have developed a Capacitive Deionization (CDI) application that uses graphene-like nanoflakes as electrodes (CDI is a relatively new way to purify water). Earlier in 2010 Korean researchers have made a new type of composite material made from reduced graphene oxide and magnetite that could effectively remove arsenic from drinking water.